October 30, 2012. In September my partner began an MFA at the art college in Dundee, and in order to do what I can to support Kate, I began a website intended to follow her progress: www.strangebundle.co.uk. I had a feeling this would awaken my semi-dormant interest in contemporary art. And I was right. Woe is me. I lament, because the present project - NOBSON NEWTOWN: An Unofficial Guide - is not going to be easy to pull off, dealing as it does with such delicate areas as a visual artist’s intellectual property rights, gallery interests, the possibility of perceived plagiarism and bandwagoning by me, and a critic’s right of ‘fair usage’. I am going to have to tread carefully. At least I have behind me experiences of writing books about Enid Blyton and Evelyn Waugh, whose literary estates are carefully tended. When Kate and I were down in London in early October, taking a look at the work of some women artists who particularly interest her, we went together into the Turner Prize exhibition at Tate Britain. Kate was in the first room, devoted to the work of Paul Noble, for not much longer than it takes to walk through it, bound for the Luke Fowler, Elizabeth Price and Spartacus Chetwynd parts of the show, but I was stopped in my tracks by Noble’s work, as I had been years before. I feel such an affinity to these large-scale pencil drawings of a fictional place whose streets, park and other communal areas are empty of people but full of evidence of human qualities and feelings: wit, self-interest, aesthetic obsession, humiliation and grief, just to be going on with. 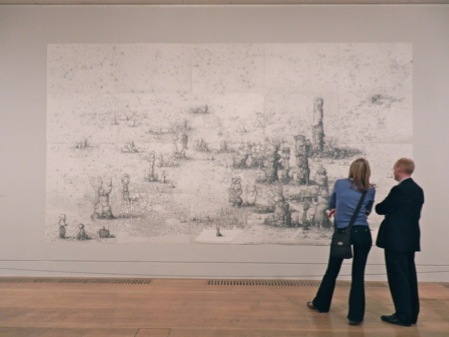 The above is not a picture of Kate and me admiring Paul Noble’s drawing Villa Joe (2005-6), consisting of a grid of 25 A1 sheets of paper. It’s a photograph taken by me - without the permission of the Tate Gallery, for which I had to grovel an apology at the time - while Kate was looking at the works on another wall, coining the phrase “Nerdsville!” and exiting gallery stage right. By the time I left the gallery I’d come to the conclusion that the drawings I’d so admired years before had somehow become part of me. Even though the work is a cultural construct, the result of someone else’s fertile and disciplined imagination, the world depicted by the drawings has taken root inside my mind. And I suspected I was going to have to find a way to come to terms with that. Pretty soon I realised that wouldn’t be any better. What was once flagged up as the penultimate drawing in the whole series is called Welcome to Nobson.